Davy Fitzgerald has made two changes from the side who beat Dublin. The minor team has also been announced. 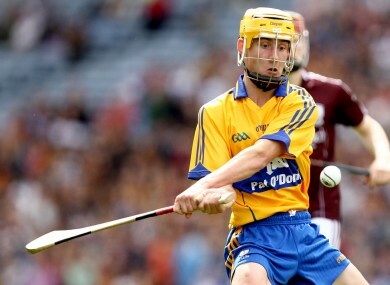 Colm Galvin in action for Clare's minor side last year. CLARE BOSS DAVY Fitzgerald will hand Championship debuts to Colm Galvin and Aaron Cunningham for this evening’s qualifier meeting with Limerick in Semple Stadium. The two debutants are the only changes to the side who overcame Dublin. Galvin is named in midfield with Seadna Morey moved to full back in place of Conor Cooney. Cunningham is named as a corner forward in place of Jonathan Clancy. Clare have indicated that the starting team is still likely to be shuffled before throw in. Clare’s minor hurlers, who will meet Tipperary in the Munster final at Pairc Ui Chaoimh on Sunday, have also released their starting line-up. Clare (senior v Limerick) : Patrick Kelly: Domhnall O Donnovan, Cian Dillon, Seadna Morey; Brendan Bugler, Patrick Donnellan, Nicky O Connell; Colm Galvin, Sean Collins; Fergal Lynch, John Conlon, Tony Kelly; Aaron Cunningham, Conor McGrath, Darach Honan. Clare (minor v Tipperary): Eibhear Quilligan: Shane O’Brien, Brian Carey, Gearoid Ryan; Aidan McGuane, Conor Cleary, Eoin Quirke; David Conroy, Alex Morey; Shane Taylor, Niall Deasy, Jamie Shanahan; Bobby Duggan, Conor Deasy, Shane O’Donnell. Email “Deep end: Clare hand out two Championship debuts for Limerick clash”. Feedback on “Deep end: Clare hand out two Championship debuts for Limerick clash”.